On Sunday 21 October a group of more than twenty volunteers took part on a working day of planting fig trees in the Torralbet farm, near Ciutadella. This farm has autochthonous cattle, and makes, amongst other products, cheese known as “Tres Tocs” from a mixture of milk from sheep, goats and cows. In order to help in product diversification the GOB volunteers planted 15 fig trees of different varieties. To enable them to grow strongly during their first years, a fence was built round each of them as protection from cattle and other animals. This day is part of GOB’s Land Stewardship Scheme which is to find economic viability for agriculture while preserving natural values. It is achieved by farms that have signed agreements with GOB thus becoming part of the Network of Agronatural Farms of Menorca that receives help and advice in many different ways. One of the practices is the organisation of agricultural volunteer days, such as this one. By the end of the morning, the fences were up, the fig trees planted and the rest of the land planted with oats.. A full morning enjoyed by the team with an excellent mid-morning snack and some encouraging results. It is possible to buy products from the Network of Agronatural Farms in the GOB shop in the Mercat del Claustre Mahon, in the GOB office, at some agricultural markets such as the Agromaó on Sunday mornings in Mahon, or in Ciutadella, or at some farms that sell direct to the public. 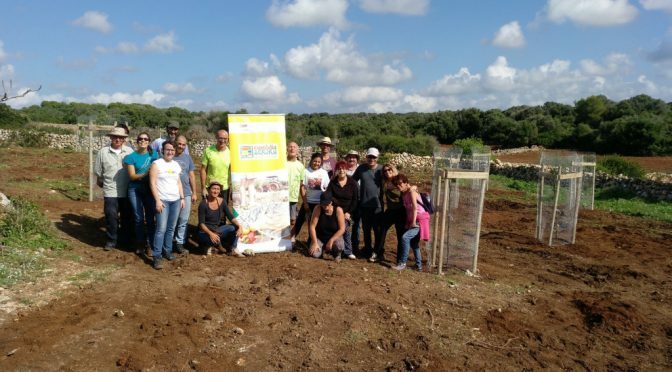 The working day planting fig trees was possible thanks to the support of the Ciutadella Town Council.